Budget constraints, utility functions and maximized utility - FreeEconHelp.com, Learning Economics... Solved! Matt has the utility function U = √XY (where Y represents pears and X represents hamburgers), income of $20, and is deciding how to allocate that income between pears and hamburgers. Both hamburgers and pears cost $1.00 each. (i) Write the equation for Matt’s budget line in slope, intercept form (y = mx + c). (ii) Matt’s utility function implies that the marginal utility of pears is 0.5√X/Y and the marginal utility of hotdogs is 0.5√Y/X . How many pears will Matt buy? How many hamburgers will he buy? (iii) This year, the price of hamburgers rise to $3 each while Matt’s income is unchanged. Matt’s father decides to help him by giving him a gift of $20. 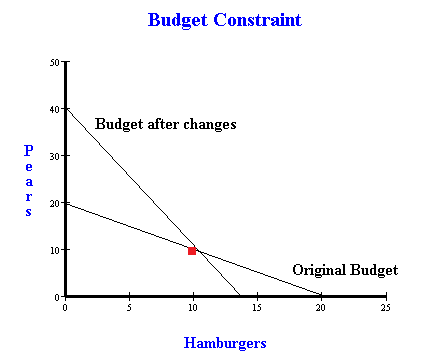 Consider an indifference curve-budget line diagram with hamburgers on the x-axis and pears on the y-axis. After Matt gets the $20 gift, will his new budget line lie above, lie below, or pass through his initial optimum? Justify your choice. Will Matt be better or worse off than he was last year? The marginal utility of hamburgers and pears is given to us, but we could also figure it out by taking the appropriate derivative (if you know calculus). In this case we would want to take the derivative of the utility function with respect to either X or Y, and this would give us the marginal utility associated with that good. One of the rules of utility maximization is that the marginal utility per dollar spent has to be equal (the other is that the entire budget is exhausted). Since the price of both goods is one dollar, we don’t have to worry about the per dollar part and can simply equate the two marginal utilities (but I will include it in the first step anyways to show what I mean). This means that we should consume the same amount of X and Y, since we have $20 and the price of each good is $1, we should consume ten of each. Now the price of hamburgers rises to $3, but his budget stays the same. This will definitely make the consumer worse off. But what happens if we increase the consumer’s budget by $20? Then we will see a shift out of the budget line, and potentially the consumer could be better or worse off. This is pretty easy to see if we construct both budget lines and make note of where the original consumption point existed. This simply means that for every hotdog we consume, we should consume 3 pears. This makes sense because the price of hamburgers is 3 times the price of pears. 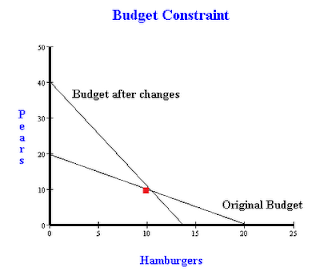 If our budget constraint is 40, and the price of pears is 1, and the price of hamburgers is 3, then we should still devote $20 each to hot dog and apple consumption except now $20 buys 20 pears, and $20 buys 6.667 hamburgers. This is the utility maximizing choice. The trick now is to plug these values into the utility function to see whether or not your utility is higher under the first or second scenario. By consuming 10 of each good our utility is equal to (10*10)^0.5 which is equal to 10, while in the second scenario our utility is equal to (20*6)^0.5 which is about equal to 10.95 which is higher. So we are willing to let the price of hamburgers triple if we can also double our budget, in fact we prefer it. You can confirm this by looking at the graph to the right.